The trouble a lot of people run into is how seemingly difficult a raw foods diet can be. Dehydrating, soaking, sprouting, slicing, dicing...all the prep can sometimes be daunting. But it doesn't have to be! Just like getting used to cooking without animal ingredients, cooking without heat just takes a little geting used to. And, yes, there are some raw chef's out there (Hi there, Juliano!) who create some really ridiculous time consuming and difficult raw recipes. But, there are also lovely raw food chef's who come up with books full of easy to follow delicious simple recipes that anyone can prepare. Raw and Simple, by Judita Wignall is one of these books. Judita is the author of two raw food recipe books, Going Raw and Raw and Simple. She's a Certified Holistic Health Counselor trained at the Institute for Integrative Nutrition and a Raw Food Chef and Nutrition Educator from the Living Light Culinary Institute. Both of her books are super bright and happy. There is an infectious positive vibe that beams from the pages. Seriously! Usually I am critical of books that feature gratuitous pictures of the author instead of the food, but Judita is so darned cute, with such an amazing smile, that it really doesn't bother me. The book is broken into three main chapters and starts out with a chapter on "Why Raw Rocks" which includes sections on what a raw food lifestyle entails, some nutritional information, and some interesting info about blood sugar levels. Next is the chapter on "The Raw Kitchen" full of shopping lists, stocking a raw kitchen, not-cooking tips and techniques, and info on sweetener and superfoods. Then, there are the recipes! The proverbial meat and potatoes of the book. 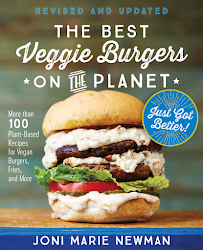 Some of my favorites so far include the Chipotle Not Chicken Salad Wraps (page 124) and the Heirloom Tomato Stacks (page 115), both of which contain only simple ingredients that can be picked up at only any grocery store. One thing I really love about Judita's recipes are the options to "lightly cook" the recipes to warm them. I find that eating only cold food would be a turn off for many, so having the option to warm these recipes is a great one. The photography is gorgeous with vibrant beautiful full color pictures of a lot of the recipes (and some of the author, as mentioned above). The book is well alid out, the design is very hip and nice to look at, and the index is very useful. Overall, this is a lovely addition to any cookbook shelf, whether embarking upon a raw foods lifestyle or not. The fine folks over at Quarry Books were kind enough to offer up a copy of this book to one lucky reader, and because they will be doing the shipping, it is only open to US residents. Simply follow the prompts in the widget below. 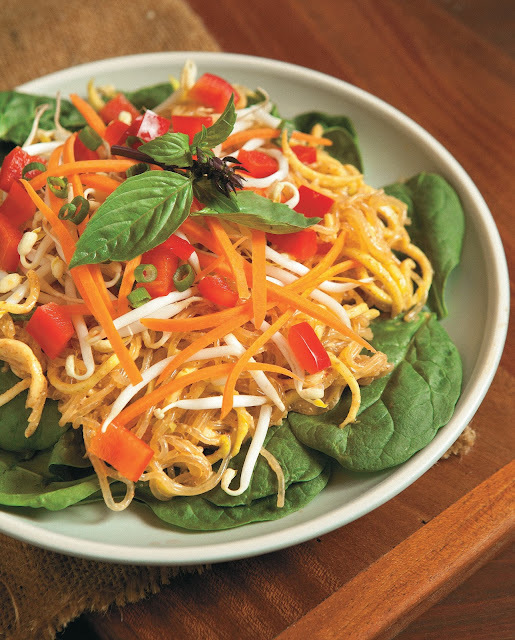 Now, to give you your own taste of one of the recipes from th book, try out the Thai Veggie Noodles below! Noodles plus creamy curry sauce plus tons of vegetables equals one of my favorite dishes. You can play around with the amount of veggies, but I like to go crazy and pile them on. If you can’t find kelp noodles in the refrigerator section of your local health food store, you can replace them with two additional zucchini. Rinse and loosen the kelp noodles and place them in a bowl. Cover the noodles with water and squeeze the juice from the lemon into it. Allow them to soak for 30 minutes. While the noodles are soaking, make your sauce by processing all the sauce ingredients until smooth in a blender. After 30 minutes, rinse the noodles and place them into a medium–size bowl. It's helpful to cut noodles with kitchen scissors, as they tend to be crazy long. Spiralize the zucchini with a vegetable spiralizer or use a peeler to turn them into ribbons. Combine the zucchini with the kelp noodles and toss with sauce. Serve the zucchini– noodle mixture on a bed of spinach and top with vegetables and shredded basil. This will last two days in the refrigerator. Chef Tip: Warm this dish by placing noodles in a dehydrator for one hour at 145˚ F (62.8˚ C) or warm in a saucepan on low heat, stirring frequently. For a lightly cooked version, place noodles and vegetables in a large saucepan or pot and warm gently for 5–10 minutes, stirring constantly. I love raw zucchini pasta! Actually have and LOVE her first book but its a tie for favorites between that and rawsomely vegan! Zucchini pasta, zucchini hummus are my favorites! Beyond the obvious of raw veggies and fruits which I love, I often make truffles! Delish! I borrowed this book from the library a couple of months ago and it's fantastic. I only had the chance to make 3 dishes but each one was amazing. The Raw walnut chili was really super fantastic, probably one of the best chili's ever!!! I don't have any raw books, so i need this one! 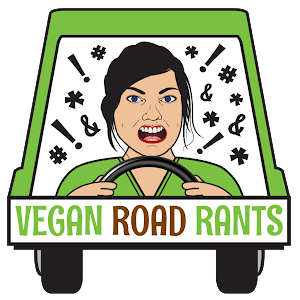 I've started reading a couple of raw blogs. 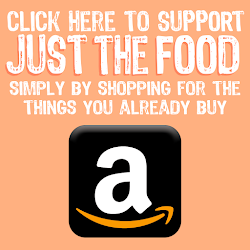 I would love to add a raw cookbook to my shelf! I enjoy watching raw fooders on YouTube. I am intrigued and would like the chance to try out a few recipes. I went raw for a week once and it was wonderful. It was nice not to have to cook. I'd like to eat more raw as it is the best way to eat for my stomach! 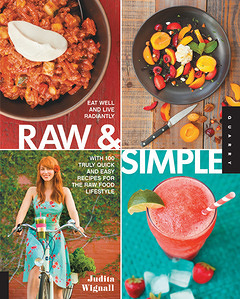 My favorite raw cookbook is Practically Raw by Amber Shea Crawley. Nearly every recipe can be made without fancy equipment like a dehydrator, and she has cooked options as well for cooler weather. It's a really user friendly book with incredibly delicious results. I don't have much experience with raw food. I'd love to try "Raw & Simple". Thanks for the chance to win a copy! raw does seem difficult to me - i'm sure this book could help. very curious about raw desserts, sprouting and dehydrating. I've never eaten raw, but it's on my list of things to become.. HOWEVER, I was reading your Easter egg article, and I was wondering how you melted chocolate in the microwave.. Last time I tried, it was Valentine's Day, and I was trying to make chocolate covered strawberries, and needless to say, all I got was burnt chocolate mess! Hi! Thank you so much for sharing your thoughts. You have such a positive attitude that is really inspiring.